A place to share my musings. There are so many ideas around us and I try to play with the ones that tickle my fancy. 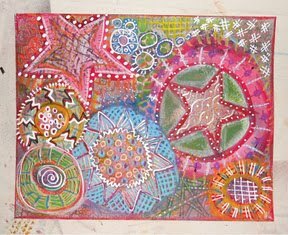 Zentangle, needle felting, wet felting, garden art, photography, kayaking. I still want to do this week's Diva Challenge, but in the mean time I've been thinking of new ideas. Next week my sister and I are heading to Finland for a week and hopefully you will be seeing some of the patterns along the way. 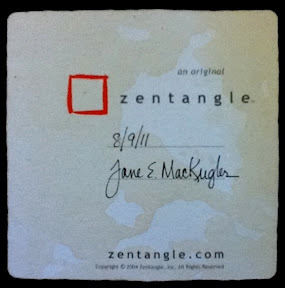 My zentangle supplies are definitely getting packed in the carry-on bag. One of my thoughts was, "what would the tile look like if I tinted it with coffee?" Oh oh, time to go to work. Top 10! Thanks to my voters. 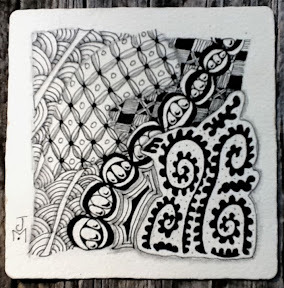 CZT (Certified Zentangle Teacher), paraeducator, instructor for Mountain Painters and Artisans Gallery, skier, kayaker, photographer, and crafter.